Santa Cruz County is in the midst of a debate over how to relieve gridlock along Highway 1. Traffic congestion has continued to worsen in recent years along the four lane freeway, to the point that an 18 mile one-way commute to or from Watsonville can take in excess of an hour each way. The Santa Cruz County Regional Transportation Commission (SCCRTC), in coordination with Caltrans, recently completed the environmental review process for a $600 million widening of Highway 1 to add HOV lanes and auxiliary lanes, doubling the width of some segments to eight lanes. Unsurprisingly, the widening project is very controversial. Proponents frame the widening as a progressive issue to reduce commute times for working class commuters from Watsonville who cannot afford to live in Santa Cruz. Opponents point out that the benefits of widening highways tend to be temporary as more capacity induces demand for more congestion, and that the widening project is not consistent with local, regional, and state sustainability legislation such as SB-375. Even Caltrans recently acknowledged that widening freeways like Highway 1 does not relieve traffic congestion over the long term, and may not even help in the short term. The Highway 1 widening project serves as a microcosm of the transportation and land use challenges facing California’s coastal urban areas. Santa Cruz County has made a generation of transportation and land use decisions built around slow growth and preserving its rural spaces and beach town, off-the-beaten-path character. The framework of this vision is now bursting at the seams due to both internal and external economic forces. When evaluating the Highway 1 project, there are no easy solutions – only tough choices that will shape the region’s future. Before evaluating whether widening Highway 1 is the best solution for solving traffic congestion issues, it is necessary to dive into the root causes of this congestion as it relates to Santa Cruz’s housing crisis. By some measures, Santa Cruz is the least affordable city in California, and perhaps the country. A perfect storm of rising demand and limited supply has produced this crisis. Spillover demand from Silicon Valley’s housing shortage has brought more high income buyers and renters to the market, while local employment growth has further increased demand. This increase in housing demand has overwhelmed a constrained housing supply, due to a mix of restrictive zoning, NIMBYs, and rent control. In recent years, the county has added roughly one housing unit for every ten residents. Median home sales in Santa Cruz now average $800,000, and median rents are around $2,000 per month. Conversely, median household income in the county is just $68,000, and the top five occupations in Santa Cruz pay around $10 an hour. As a result, nearly two-thirds of renters countywide live in unaffordable housing in which their rent is greater than 30 percent of their income. The City also has one of the highest concentrations of homeless residents in the country. Over the past two decades, a majority of Santa Cruz County’s new housing construction has occurred in the relatively more affordable Watsonville area, where the median price for a home ($480,000) is still high, but about 40 percent lower than Santa Cruz. Consequently, gridlock along Highway 1 between Watsonville and Santa Cruz has increased substantially. SCCRTC has proposed two phases of improvements to Highway 1. Over the short term, auxiliary lanes would be added between on-ramps and off-ramps, beginning between Soquel Drive and 41st Avenue. Over the long-term, carpool lanes would also be added between the San Andreas Road/Larkin Valley Road interchange and the Morrissey Blvd interchange (like most carpool lanes in Northern California, the lanes along Highway 1 would only be enforced a few hours a day). The addition of carpool lanes represents a significant endeavor, requiring the reconstruction of many overpasses and bridges. SCCRTC expects the carpool lanes to fully accommodate 2035 travel demand along the corridor, reducing peak hour travel times on the segment from an hour to just 15-20 minutes. But carpool lanes would also increase vehicle miles traveled (VMT), which is where the project gets problematic. Under SB-375, the Association of Monterey Bay Area Governments (AMBAG), to which Santa Cruz County is a member, is required to reduce VMT by five percent by 2035 through sustainable land use and transportation strategies. Yet the Highway 1 widening project would increase VMT significantly – SCCRTC projects about a 30 percent increase during the AM and PM peak periods. Moreover, it is possible that SCCRTC underestimated the VMT increase associated with widening Highway 1. A UC Davis study found that increased capacity tends to induce a roughly equivalent increase in VMT, eliminating purported benefits of congestion relief. A 10 percent increase in roadway capacity leads to a 3-6 percent increase in VMT in the short term and a 6-10 percent increase in VMT in the long term. Sure, carpool lanes incentivize carpooling and commuter bus use, but they also make it easier for everyone to drive – which is why SCCRTC expects average vehicle occupancy to increase by less than ten percent. Given the state of Santa Cruz’s housing market, it’s reasonable to assume that new highway capacity would enable substantially more growth in the Watsonville area, and therefore increase VMT and congestion until Highway 1 once again reaches capacity. For these reasons, many local environmental advocates, like the Campaign for Sensible Transportation, oppose the project. The question for Santa Cruz County, therefore, is not how can you cure congestion, but how can you support sustainable growth and give people choices to avoid congestion? SCCRTC has other mobility options at its disposal beyond widening Highway 1 which support local and statewide sustainability goals. A ‘kitchen sink’ approach of new or expanded transit service, bicycle and pedestrian upgrades, transportation demand management strategies (TDM), and infill-supportive development policies could expand the capacity of person-movement without increasing VMT and greenhouse gas emissions. SCCRTC has evaluated some of these options in isolation, but has not conducted a comprehensive analysis of such alternatives compared to highway expansion. One intriguing option is the introduction of passenger rail service between Santa Cruz and Watsonville. 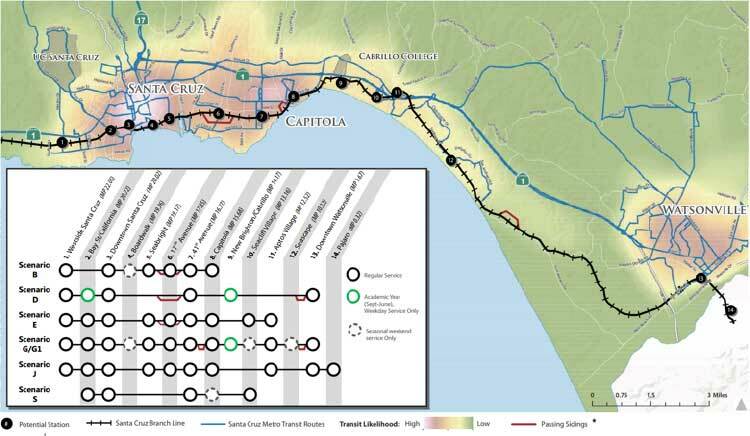 SCCRTC recently completed a feasibility study for passenger rail service along the Santa Cruz Branch Line, a mostly inactive single-track rail corridor that the agency purchased in 2012. Approximately 90,000 people live within one half mile of the rail corridor, which parallels Highway 1. The proposed service could provide a 40 minute trip between Santa Cruz and Watsonville and include about a dozen stations as well as a parallel bicycle and pedestrian trail. An intermodal connection could ultimately be provided at Pajaro Station if Capitol Corridor service is extended to Salinas. The proposed rail service has some flaws, though, which limit an apples-to-apples comparison with the Highway 1 widening project. SCCRTC’s study estimates that a rail line would serve around 5,000-7,000 passengers per day and cost $133-$176 million to build. However, a key limitation of the feasibility study was its assumption of infrequent 30 minute service – resulting in a rail service that would provide an accessory to driving, as opposed to a viable alternative. A more frequent 15 minute service would significantly enhance ridership and person-movement capacity. Yet, existing railway constraints would require some significant tradeoffs to achieve 15 minute service: the need for multiple passing tracks along the narrow right-of-way could substantially increase costs and necessitate acquisition of new right-of-way. More trains would increase delays for other users along at-grade crossings. Regardless, rail service by itself would not be enough. A ‘kitchen sink’ approach would also necessitate additional transit investments, such as more frequent bus local service, bus rapid transit along Soquel Drive, and expanded Highway 17 express service. Active transportation investments, especially those which improve transit access for existing neighborhoods and new transit-oriented developments, would capitalize on shifting short trips away from driving. A transportation management agency (TMA) could administer a citywide TDM program to incentivize use of non-auto modes. Traffic improvements such as smart corridor management strategies and targeted auxiliary lanes could also be considered, as could more robust measures like market-based parking pricing or congestion pricing. Overall, such an approach could be just as expensive as widening Highway 1, but without the detrimental impacts to the environment and public health. Unfortunately, Santa Cruz County residents will not have the opportunity to participate in a clear conversation and comprehensive evaluation of the tradeoffs between freeway widening and the ‘kitchen sink’ alternative prior to making a decision on the Highway 1 project. In November, Santa Cruz County residents will vote on a transportation sales tax measure, Measure D, to decide the future of the Highway 1 project. The measure would raise $500 million over 30 years, dedicating 30 percent to local road repair, 25 percent to Highway 1 improvements, 20 percent to transit, 17 percent to the coastal rail trail, and eight percent to railroad maintenance and improvements for potential passenger rail service. The Campaign for Sensible Transportation opposes the measure. A similar measure failed in 2004, which dedicated 65 percent of funding to highway widening. While this measure would not fully fund the widening of Highway 1, its passage would provide a voter mandate to move forward with the project. Ultimately, Santa Cruz’s traffic problems all come back to its housing crisis. Without significant growth in housing in walkable, bikeable, and transit-accessible neighborhoods, any transportation improvement will serve as a temporary band aid. Changing a region’s transportation and land use paradigm is hard work – especially with so much at stake – but in the long run, it may be the only choice for Santa Cruz to be a sustainable, equitable, and prosperous community. A solar-powered, elevated Personal Rapid Transit system could connect Watsonville to Santa Cruz for a fraction of the cost of an additional highway lane (and with higher capacity). It would provide safe, on-demand transportation with little or no carbon emissions. What a great alternative to being stuck in traffic!